Yes, now Hugh Jackman is part of the mysterious Dundee movie that showed up out of nowhere last week. He officially announced his participation in the massive Super Bowl commercial this morning. And he appears to be playing someone of great importance. Perhaps he's supposed to be the President of Australia? This DundeeSuper Bowl ad is for Australian tourism, and they're pulling out all the stops. They first pranked just about everyone, with this Crocodile Dundee sequel appearing to be a real movie, one that was announced as arriving in theaters this summer. People were suspicious, and no one believed this could be real. The whole project was later outed as a big Super Bowl commercial. One that stars Danny McBride as Brian Dundee, son of the iconic Outback legend. Paul Hogan is returning to reprise that role, though we have yet to see him. And fellow Aussie Chris Hemsworth is playing a tour guide. 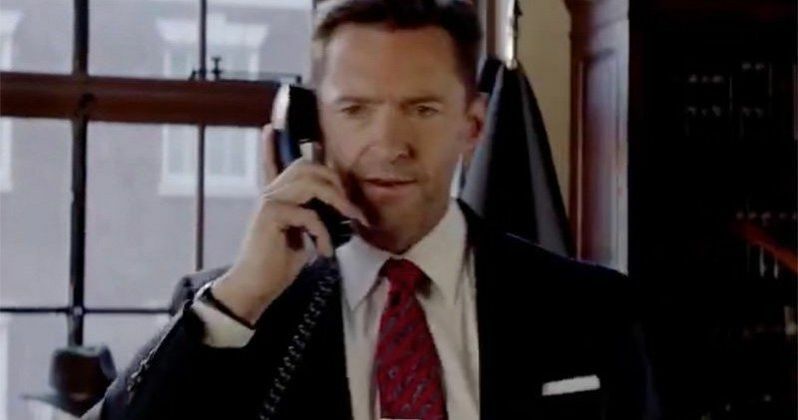 Now we have Hugh Jackman, irritated and on the phone, being just as charming as ever. "Mate, that wasn't a kangaroo, that was a wallaby. Listen, the deals off. Wanker...(sighs, talking to someone off screen) How's the surf by the way?" He appears to be talking to our President, Donald Trump. And it's a mildly funny bit. As have been the other released clips. Some people have been questioning the $30 million price tag stuck on Dundee, which cost more than some of 2017's biggest movies including Get Out and Split combined. But once we add in the paychecks for Danny McBride, Paul Hogan, Hugh Jackman and Chris Hemsworth, added to the fact that Super Bowl commercials are extremely expensive, and this is going to be a long one, we no longer need to question where the money has gone. It's all right there on screen. Dundee is produced by Rimfire Films (the company behind the first two Dundee movies). So far the Dundee team has released two trailers and a full clip, still pretending to be a real movie. There is an official website, and plenty of behind-the-scenes photos, and an extensive synopsis that's longer than most real movies. "Crocodile Dundee is back. Well, actually, he's missing in the Outback. And the only person who might be able to find him is the loudmouthed American son no one knew he had. Introducing Danny McBride as Brian Dundee. This son of a legend is forced to channel his Aussie roots as he embarks on the ultimate adventure in the land down under. It's time to live up to the family name. Unlike his father, Brian grew up a true city kid. But that won't stop him from picking up his dad's oversized knife and launching into the Australian outback, completely unprepared for what lies ahead." Chris Hemsworth is playing Wally Jr., the son of Crocodile Dundee's business partner Walter "Wally" Reilly, who was played by John Meillon in the first movie. There's no time schedule yet as for where this big, bad Dundee spot will drop during the Super Bowl. And who knows, if it's popular enough, it could be turned into its own movie. This sneak peek comes directly from Hugh Jackman's Twitter.